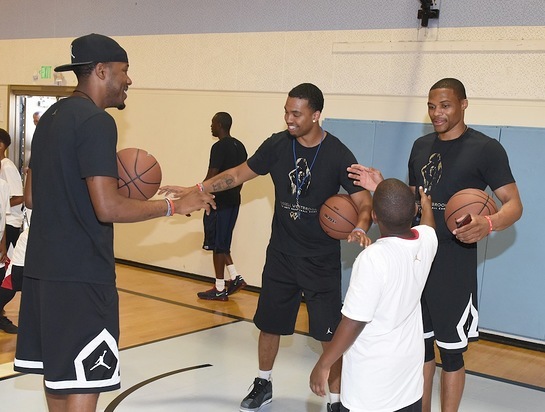 Russell Westbrook returned to the Jesse Owens Recreation Center in Los Angeles to host the 4th annual Russell Westbrook Why Not? Foundation Basketball Camp last week, showing children ages 7 to 14 in the inner city basic basketball skills. Russell, along with his parents and staff, taught kids basketball fundamentals, played scrimmage games, and handed out awards at the end of the camp. The camp was the third session of the summer, completing the series of camps held in Tulsa and Oklahoma City, Oklahoma the previous two weeks. The camp was held at the park where Russell and his brother, Ray Westbrook, grew up playing sports. With this pro bono camp Russell was able to go back home, and not only serve as a source of pride for the community, but also give back to those in the area that mean so much to him. The event was held at the Jesse Owens Recreational Center, 9651 Western Ave, Los Angeles, California and featured with donations from Jordan, 808 Audio and Snackeez.